Ecoscaping: What are Green Walls? | Ciminelli's Landscape Services, Inc.
Green walls have nothing to do with paint, but are living structures composed of green plants. 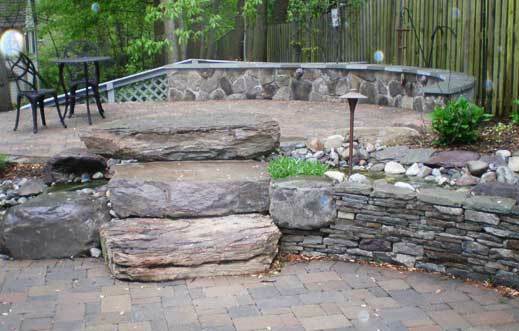 Ciminelli’s Landscape Services in Lothian, Maryland, are experts in the art of ecoscaping and the utilization of living plants on roofs and wall structures. Not only lush and beautiful, green roofs and walls add to the natural feeling and design. They can be part of an existing structure, such as a tool shed or patio as well as used in a retaining wall. Allowing for the rain to slowly permeate the soil, instead of running off, puts less pollutants in bays, rivers and nearby creeks. Installed at an existing low spot, native plants as well as those that tolerate both wet and dry conditions are used. Providing a hard surface for walking as well as driving, pervious pavers allow storm water to drain into the ground, a feature not intended by traditional paving. Ciminelli’s can help you help the environment, while creating lasting beauty for your home or business. Now is the time for Ecoscaping. This entry was posted in Annapolis Hardscaping, Blog, Ciminelli’s Take Over Meadowfarms, Customer Testimonials, Eco-Scaping, Ecoasis Garden Center, Fertilize, Firepit Annapolis, Go Green, Green Landscaping, Green Walls and Green Roofs, Growing Green Pledge, Hardscaping, Landscape Annapolis, Landscape Services, Landscaping, Landscaping Annapolis, Remake Nursery as ‘Eco-Oasis’, Winter Landscaping Tips, Winterizing for Winter, Winterizing Lawn and tagged Annapolis, Ciminelli's Landscape Services, Landscape, Landscape Annapolis, Landscape Design, Landscape Design Annapolis, Landscaping Services, Maryland on October 15, 2013 by admin.